The unique beauty and pleasing fragrance of carnivorous plants lure unwary prey into their clutches. From an insect’s point of view, carnivorous plants are lovely to behold until they grab hold. To be classified as carnivorous, a plant must attract, capture, kill and digest its prey. A carnivorous plant uses its prey’s nutrients in its metabolic processes, but not as a source of energy, said David Trinklein, University of Missouri Extension horticulture specialist. Carnivorous plants use a number of ingenious techniques to capture prey. After luring unsuspecting victims via colorful markings or irresistible fragrance, the plants use mechanisms such as pitfall traps, snap-shut traps and sticky materials not unlike flypaper to hold on to a victim until it meets its demise. Growing carnivorous plants is an interesting but rewarding challenge for the plant enthusiast, according to Trinklein. Venus flytrap, pitcher plant and sundew are some of the types commonly grown indoors. Since these are bog plants, they need constant moisture and high humidity. A closed terrarium provides the best growing environment for them in the average home. They also need an acid, organic growing medium such as sphagnum peat or sphagnum moss. Trinklein recommends a mixture of two parts sphagnum peat and one part clean sand for most carnivorous plants. Carnivorous plants need bright light for optimum growth and color development. But setting a closed terrarium in a sunny window is not a good idea because it is likely to become too warm inside for the plants to thrive, he said. A more practical solution to the need for bright light might include positioning fluorescent lights as close to the terrarium as possible without touching it. How do you feed carnivorous plant in a terrarium? “Very carefully,” Trinklein chuckled. Actually, it is not that difficult, he said. Feeding them a few small insects per month should suffice. Avoid the temptation to use meat instead of insects, he said. If catching insects is not to your liking, then Trinklein recommends fertilizing the plants with a nutrient solution one-fourth the recommended concentration about every two months during the spring and summer only. 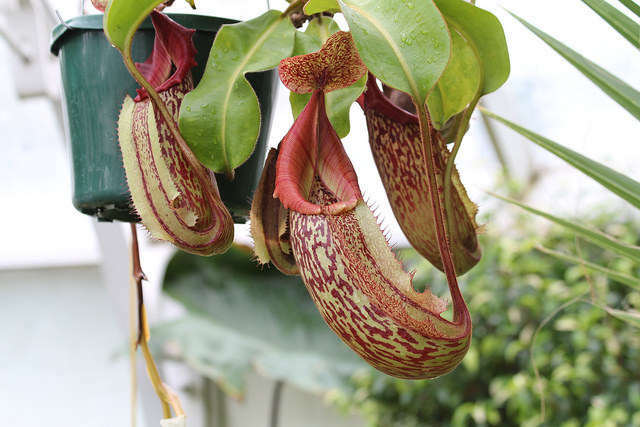 He said that a relative of the insectivorous pitcher plant has the distinction of being the largest known carnivorous plant. It has vessel-like traps 12 inches in length on vines up to 50 feet long. Although its traps have devoured frogs and an occasional small rodent, the greatest danger to humans is from tripping over its vines while hiking through the rainforests of Southeast Asia, its native habitat. For more information from MU Extension on plants and flowers, go to extension.missouri.edu/LawnGarden.